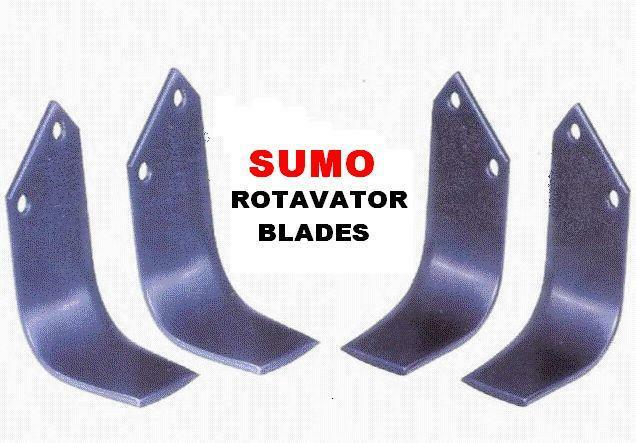 The imported SUMO brand blades has a sharp edge, even size, weight and width whereas the local blades does not have these qualities thereby taking more load, consuming more diesel, weakening the drive unit like the crown wheel, pinion, chain, jack shaft and rd shaft etc. The imported SUMO brand blades will give you a very fine tilth of the soil because of the even size of the blades. The imported SUMO brand blades will have an extra life upto 20-30 % when compared to the local blades. By using the local blades, it will bend and break once the blades are used to more than 60 to 70 % as it becomes thin. Where as the imported SUMO brand blades can be utilized to the maximum. By using the local blades that are made of cheap material will break when the unit is in operation. But when imported SUMO brand blades are used any breakages or bending of the blades are ruled out.